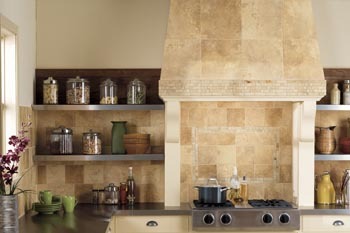 Give the heart of your home a breathtaking new look with our kitchen backsplashes. Flooring America Clive provides a variety of backsplashes, as well as comprehensive backsplash installation services for homeowners looking to update their current kitchens or those building a new home. No matter what your personal home décor style is, the goal of our services is to give your kitchen a cohesive look. With tile backsplashes, stone backsplashes, and marble backsplashes available, we have just the right materials to complete the vision you have for your kitchen. Visit us at our showroom to peruse our stunning collections, which are available in a variety of colors, materials, and designs. Our expert associates are happy to locate the material that best suits your needs in performance, looks, and price. You can also learn more about our trained technicians who provide careful backsplash installation services. Whether you have contemporary tastes or a classic aesthetic, a tight budget or a blank check, you can count on us to provide the kitchen backsplashes that best suit your home. Our expert associates maintain intimate knowledge of all our products and materials to answer any questions you may have. They also take your family’s lifestyle and the look you want to achieve into account in order to make the right recommendations. For example, porous marble might not be the best choice for a home with very young children, as the material is more prone to stains than other materials. Stop by the showroom today to take advantage of our friendly backsplash specialists. Our experts are also happy to discuss our premium financing options so you can get the kitchen backsplashes you want at an attractive price. Achieve the look you want without the hassle with our careful backsplash installation services. Our professionally trained backsplash installers are always respectful of you, your family, and your home when they perform their services. With the intensive training our installation specialists undergo, you can rest assured they take every precaution to give you a beautiful finish to your kitchen. Enjoy the beauty of your tile, stone, or marble backsplashes for years to come when you schedule our services. Contact us to learn more about our kitchen backsplashes. We proudly serve customers throughout Clive, Des Moines, Urbandale, IA, and the surrounding areas.